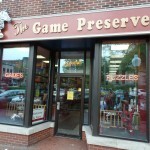 The Game Preserve is a fairly well known game store around here. In Indianapolis, they have locations over near Keystone at the Crossing, as well as down in Greenwood. They also have locations in both West Lafayette and Bloomington, and while I haven’t visited Boilermaker country in a while, I did spend a Saturday down in the land of the Cream and Crimson a few weeks ago, and I had the opportunity to visit their location. What do I do whenever I visit a new (to me) comic, game, or toy store? Why, I take pictures, get information, and tell everybody about it! So, what did I think of Game Preserve in Bloomington? The first thing I noticed when I walked in was how open the store was. It has an entryway from both the street, and the interior of (what I assume is) a mall, so it’s a straight shot from one end to the other, with no back room for gaming like the other stores I’ve visited has. They are very well stocked with the standards, though: collectible card games, role playing games, miniature gaming accessories, puzzles, and the like. They also had some collectibles, like the Funko blind boxes, and some Japanese Star Wars blind boxes, of which I purchased, happily. The gentleman behind the counter was very friendly, and answered all of our questions very well. I think he was a bit overwhelmed by all of the Welcome to Night Vale fans that were in town (the store is less than a block from the theater where it was held!) but he was covering very well. I heard him answer questions from kids cosplaying as their favorite characters, normal customers, and people from my group, and he was very polite, and treated everyone the same. I found this to be a good sign, at least for this one clerk. The Game Preserve in Bloomington was about what I expected for one of their locations. It was well lit, friendly service, and it had a good selection of games and puzzles. It’s only five our six blocks from campus, to my understanding, and it looks to be a good resource for gamers in the area. Honestly, it’s not worth a road trip from Indianapolis, or West Lafayette, because it’s more of what we know and love, but it’s great for the folks in Bloomington and the surrounding area! What are they? 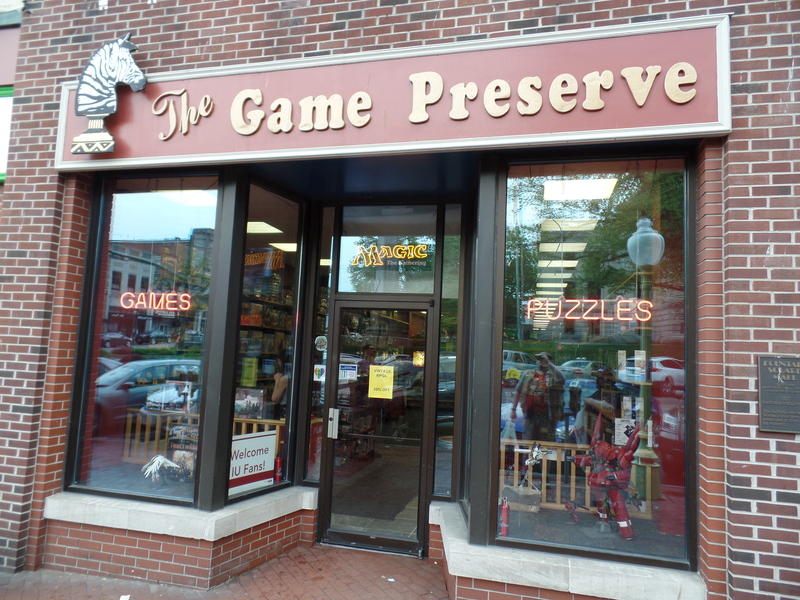 They are part of a local chain of stores that carry all manner of gaming supplies (tabletop, role playing, card, collectible card, miniature) as well as puzzles, chess sets, and some collectibles. When are they open? Monday through Saturday from 10:00 AM to 10:00 PM, and Sunday from 12:00 PM to 5:00 PM. Just kidding! It’s the future! Internet! Where are they online? Their section of the Game Preserve website is located here! You can also check out their Twitter account and their Facebook page!